Nd:YAG laser in the management of low back pain. Effect of pulsed Nd:YAG laser in the treatment of neuropathic foot ulcers in children with spina bifida: a randomized controlled study. Demartis F., De Cristofaro R., Fasulo MR, Boccalandro E., Cobianco A., Santagostino E.
Analgesic effects of high intensity laser therapy (hilt) for chronic hemophilic artrhopathy: a pilot study on safety, tolerability and clinical outcomes. High Intensity Pulsed Nd:YAG Laser in painful knee osteoarthritis: the biostimulating protocol. High Intensity Laser Therapy in hand osteoarthritis: a mixed protocol’s proposal. Short-term effect of high Intensity Laser Therapy versus ultrasound therapy in the treatment of low back pain: a randomized controlled trial. Munarolo D., De Lazzari F., Giordan N.
Randomized, controlled, clinical study to evaluate the efficacy and safety of glucosamine hydrochloride and chondroitin sulphate in combination with physical therapy (HIRO+kinesitherapy) versus physical therapy alone in patients suffering from osteoarthritis of the knee. Ebid A.A., Thabet A.A., Helal O.F. Effect of pulsed high intensity Nd:YAG laser in treatment of chronic diabetic foot ulcer. Thermal effects of NIR laser radiation in biological tissue:a brief survey. Relationship between cellular and systematic effects of pulsed Nd:YAG laser. The HILT domain by the pulse intensity fluence (pif) formula. The challenge of shoulder pain. Viliani T., Martini C., Mangone G., Pasquetti P.
High intensity Laser Therapy in knee osteoarthritis: comparison between two different pulsed-laser treatment protocols. 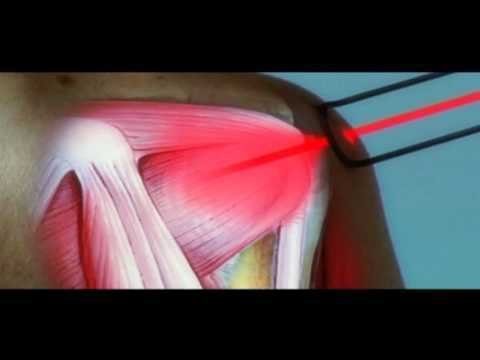 Santamato A., Solfrizzi V., Panza F., Tondi G., Frisardi V., Leggin B.G., Ranieri M., Fiore P., Short-term Effects of High-Intensity Laser Therapy Versus Ultrasound Therapy in the Treatment of People With Subacromial Impingement Syndrome: A Randomized Clinical Trial. Clinical experience using Hilterapia in “knee arthrosis”. Conte P.G., Santamato A., Fiore P. Lopresto A., Mazzaracchio M.
Treatment of chronic low back pain: back scholl versus Hilterapia. Viliani T., Ricci E., Mangone G., Graziani C., Pascuetti P.
Effects of Hilterapia vs. Viscosupplementation in knee osteoarthritis patients a randomized controlled clinical trial. Hilterapia efficiency in handling the post surgical pain after the release of the carpal tunnel. Monici M., Cialdai F., Fusi F., Romano G., Pratesi R.
Effects of pulsed Nd:YAG leser at molecular and cellular level. A study on the basis of Hilterapia. Bodini G., Croce A. M.
Treatment of proprioceptive balance disorders: comparison between kinesistherapy and Hilterapia. Clinical results in treatment of gonarthrosis with HILT therapy. Comparison between II generation cyclo-oxygenases and HILT in the treatment of backache. Conte PG, Lelli G, Lopresto A, Mazzaracchio M.
Treatment of chronic lumbosciatalgy: back school versus Nd:YAG laser. HILT therapy. An approach in the treatment of lumbosciatalgy. Buda R, Di Caprio F, Ghermandi R, Buda M.
HILT in the treatment of patellar tendinopathy in sportsmen. Santamato A, Ranieri M, Ianieri G, Fiore P, Megna G.
HILTherapy in the pain of bicipital long caput and /or subacromial conflict. Percorso riabilitativo complesso nella sindrome della “spalla dolorosa” da rottura parziale e da tendinopatia calcifica della cuffia dei rotatori. La sindrome del tunnel carpale: trattamento con HILT-Terapia. Saggini R..Bellomo R.G., Baldassarre V.
Therapeutic approach with HILT-therapy in the pathology of the shoulder with tenosynovitis of the omeral biceps. Buda R., Buda M., Gigolo B., Di Caprio F., Ghermanti R., Zati A. The Nd:YAG laser in the treatment of the osteocartilagineous lesions of the knee . Di Caprio F., Ghermanti R., Grandi G., Buda M., Buda R.
Zati A, Fortuna D, Valent A, Filippi MV, Bilotta TW. High Intensity Laser Therapy (HILT) versus TENS and NSAIDs in low back pain: clinical study. Trattamento della lombalgia causata da ernia del disco. Confronto tra LASER ad alta potenza, TENS e FANS. Zati A, Cardillo I, Fortuna D, Bilotta TW. Conservative treatment of low back pain caused by intervertebral disk displacement: comparison among Nd:YAG laser therapy, TENS and NSDAIDs. The effect of High Intensity Laser Therapy (HILT) in the treatment of osteoarthritis (OA) lesions. Zati A, Buda R, Fortuna D, Valent A, Filippi MV, Esposito E, Rossi G.
Nuove prospettive Fisiochinesiterapiche nel trattamento delle lesioni cartilaginee. Fortuna D, Paolini C, Ronconi L.
Low Level Laser Therapy (LLLT): comparison between randomized double-blind clinical trials. Tarantino C, Rossi G, Flamini G, Fortuna D.
Cytoproliferative activity of the HILT: in vitro survey. Fortuna D, Rossi G, Zati A, Cardillo I, Gazzotti V, Pinna S, Venturini A, Piana M, Paolini C, Masotti L.
Pilot study of the Nd:YAG laser in experimentally induced osteoarthritis in an animal model. Fortuna D, Rossi G, Paolini C, Magi A, Losani F, Fallaci S, Pacini F, Porciani C, Sandler A, Dalla Torre R, Pinna S, Venturini A. The Nd:YAG pulsed wave laser as support therapy in the treatment of teno-desmopathies of athlete horses: a clinical and an experimental trial. Fortuna D, Rossi G, Zati A, Cardillo I, Bilotta TW, Pinna S, Venturini A, Masotti L.
Nd:YAG laser in experimentally induced chronic degenerative osteoarthritis in heavyline chicken broiler - pilot study. Fortuna D, Rossi G, Zati A, Gazzotti V, Bilotta TW, Pinna S, Venturini A, Masotti L.
High Intensity Laser Therapy in experimentally induced chronic degenerative tenosynovitis in heavyline chicken broiler. Zati A, Fortuna D, Cardillo I., Gazzotti V., Cameli O., Ferrari G., Bigotta W.
High Intensity Laser Therapy in the treatment of gonarthrosis: the first clinical cases and the protocol for a multicentric, randomized, doubleblind study. Rossi G, Fortuna D, Tarantino C, Flamini G, Masotti L.
Cytoproliferative activity of the HILT: in vitro investigation. Fortuna D, Rossi G, Zati A, Gazzotti V, Billotta TW, Pinna S, Venturini A, Masotti L.
High Intensity Laser Therapy during chronic degenerative tenosynovitis experimentally induced in chicken broiler. High Intensity Laser Therapy in osteoarthritis: study in an animal model. Fortuna D, Rossi G, Zati A, Gazzotti V., Bilotta TW, Pinna S, Venturini A, Masotti L.
High Intensity Laser Therapy in tenosynovitis: study in an animal model. Mesoterapia e laser terapia di potenza (Nd:YAG) nel recupero precoce dell'atleta infortunato affetto da tendinopatia achillea.